The Phytophactor: Talk about a stimulating tattoo! The Phactor gets asked to identify lots of botanical specimens, often from just an image. This arrived via email thanks to some anonymous correspondent, and they simply asked if this was botanically accurate? Well, to know that you have to determine what was being illustrated. And that isn’t too difficult, this is clearly Coffea arabica, coffee, and it not only is botanically accurate but copy of a classic botanical illustration. But this is almost a new one on the Phactor. Only once before has the identification been based on an image tattooed into someone’s dermis. One of my recent students had a hibiscus on her shoulder blade. Are gardeners going to start sporting tattoos of their favorite plant? Are botanists going to start bearing some indelible record of their research organisms? Who knows where this may lead, perhaps more students in my plant taxonomy class! Perhaps more tattoo pictures! Whether you like inked skin or not, you'll have to agree that scientists' tattoos are cleverer than most. My favorite is the cladogram of the five kingdoms. Now that's a lot of ink! Well, who knew? Things like this make the Phactor feel old. Although botany was not very well represented, bluegrass was my favorite, figs and fig wasps were a close 2nd. I did this tattoo! 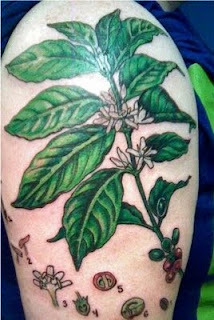 This tattoo is on my close friend and fellow coffee enthusiast. My name is Phoebe Aceto, I work at Model Citizen Tattoo in Ithaca, NY. I also own and operate a specialty coffee shop (The Shop Cafe) that shares a space with Model Citizen. I have done a lot of scientific and botanical work. Congratulations Phoebe, it's quite the piece of work, and hopefully this will bring you some more business. It almost certainly was not sent to me by your friend, so it came to me secondarily, to attest to its authenticity. Oh, and do tell the Phactor if you've ever been asked for a botanical tattoo by a botanist. I've done a full sleeve of beets on a farmer, more Coffee Arabica on another Barista, the list goes on... No botanists yet!